It took us until 9:15 this morning to pack up and pull ourselves away from the balcony of our Homewood Suites room with its entertaining view of Savannah River traffic to and from the port. The third busiest port in the U.S.—behind only Los Angeles and New York—Savannah moves more than 3 million shipping containers each year. THE MARINA STEAMS PAST OUR BALCONY. We followed US-80 northwest out of Savannah and into Garden City (pop. 8,794), home to much of Chatham County's heavy industry. 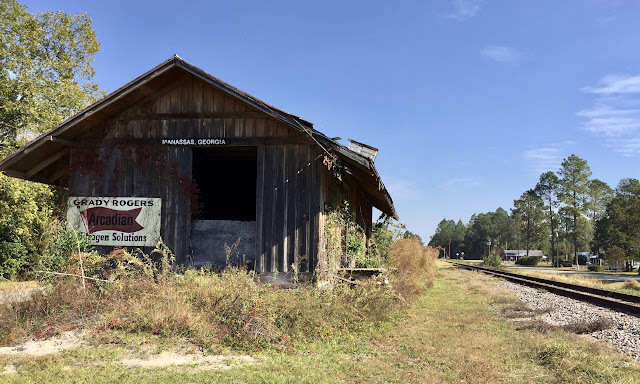 The well-developed four-lane highway then took us through the larger town of Pooler (pop. 21,187), where we found a couple of letterboxes at the museum of the Mighty Eighth Army Air Force, which played a key role in the European theater during World War II. THIS F-4 OFFERED EXCELLENT COVER WHILE WE SEARCHED FOR HIDDEN TREASURE. At the tiny crossroads of Ellabell, we deviated from our route and turned onto US-280, a spur of 80 that travels through rural areas and small towns of central Georgia and Alabama before terminating in Birmingham. As we drove into the tidy little hamlet of Daisy (pop. 128), I was struck with the memory of carving a stamp of a daisy some seven years ago. The letterbox the stamp was meant for was never planted, and that very stamp was in our supply box begging to go out into the world on its own. So we planted that daisy in a box called "Driving to Daisy" hidden on a restored caboose on Railroad Street. FINALLY THE LITTLE DAISY GETS A HOME. Before leaving town, we chanced to meet Byrd, Daisy's police chief/postmaster/mailman. He was quite surprised that we were visiting his town on our Tybee to San Diego road trip. "That's a long way," he said. After a pause, "That's a real long way!" We learned that Daisy was founded in 1890 as a railroad town. Locals wanted to name the town Conley after a Methodist minister, but the application for a post office was rejected because Georgia already had a town by that name. It didn't take much imagination or persuasion to convince settlers to re-submit the postal paperwork asking to name the town Daisy, in honor of the Reverend Conley's beautiful granddaughter. Daisy grew into a prosperous trade center with numerous retail establishments, a cotton gin, and a turpentine mill. But then rail traffic diminished and so did Daisy. In recent years, preservation efforts have led to the restoration of a handful of original buildings on the main drag to make the town more attractive. Just a few miles west we drove into Claxton (pop. 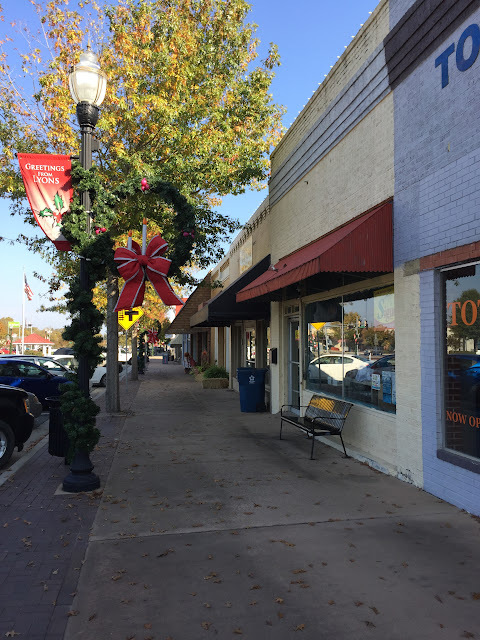 2,393), the county seat of Evans County and self-proclaimed "Fruit Cake Capital of the World." Truth be told, their boast has probably never been disputed. Convinced we'd see the bakery bustling in full throttle production of holiday cakes, we dropped in at the Claxton Fruit Cake Company only to learn from Patti in the company store that the production for Thanksgiving and Christmas—their primary season—kicks off the first week in September and winds up in October. By this time of year, employees are awash in cakes and shipping materials. 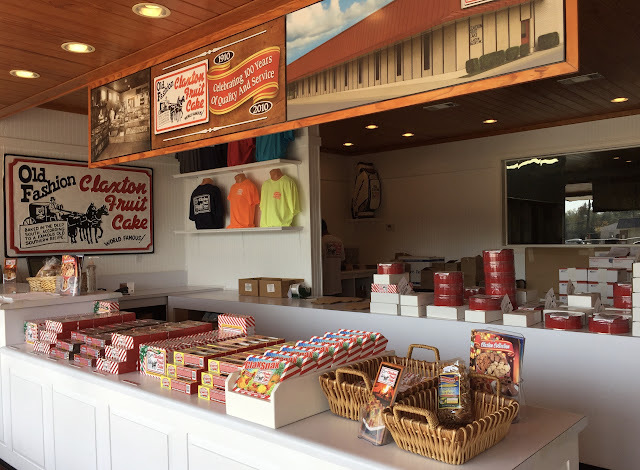 CLAXTON FRUIT CAKES COME IN TWO FLAVORS: REGULAR AND DARK (MADE WITH MOLASSES). According to Patti, the bakery ships fruit cakes all over the world, both retail and wholesale. Walmart is their largest customer and merits their own unique packaging and product sizing. When pressed to tell us another country where they ship to merchants, Patti was unable to do so, but this is her first "season" working at the company. 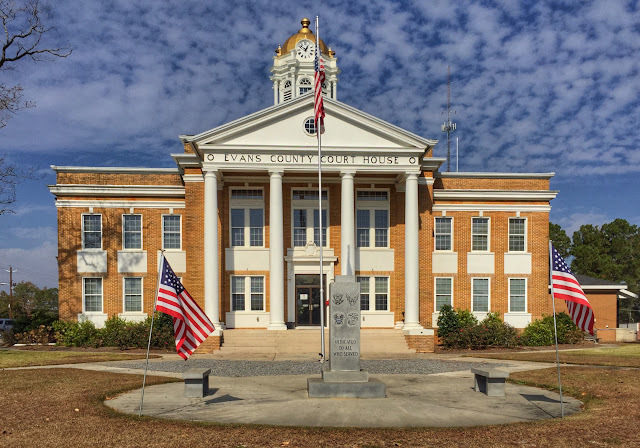 Having previously traveled to the Georgia State Prison in Reidsville to encourage an inmate to relinquish custody of his minor children, for whom I was an advocate, we didn't feel a need to return to the city. So we headed off US-280 onto GA-292 at Manassas, a wide place in the road with an area less than one square mile and a population of 94. THANKFULLY WE REALIZED THE DANGER OF BLINKING WHEN WE PASSED THROUGH MANASSAS. We drove through a string of small towns along the state highway until we reached Lyons (pop. 4,367), the county seat of Toombs County, best known as the source of Vidalia onions. By the time we rolled into town, the clock was pushing 2 p.m., and our stomachs were growling for lunch. Expecting small town fried food diner fare at best, we drove cautiously up Broad Street, Lyons' main drag. 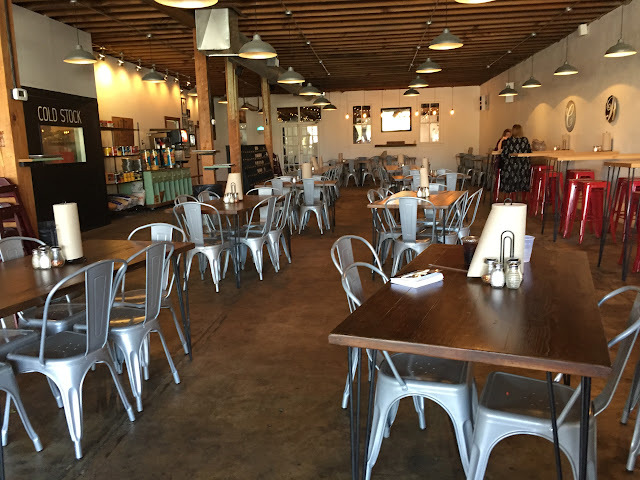 Seeing customers leaving Hardware Pizza with contented smiles, we decided to give it a try. We soon learned why people were grinning. This middle of nowhere urban style eatery was serving up crispy brick oven style pizza, an enticing list of craft beers, and flavorful farm to table salads. With an open floor plan and relics of its hardware store past, the restaurant was a wonderful small town surprise, and our pizza was one of the best we've ever eaten. THEY DON'T SELL USED BOOKS, ONLY PREREAD ONES. What actually drew us to Lyons was a letterbox at the local used bookstore. Under new ownership, the store is now called Broad Street Bound, but the owner hasn't gotten around to changing the sign yet. Tended by a retired teacher, the store's inventory is obsessively organized and tidy. Seemingly glad to have someone to talk with, "Joan" roamed the store and chatted with us as we searched for the box. We had admitted we were seeking "hidden treasure" so she knew what we were looking for. Clearly an overachiever, she has been in the business only a few years but has schooled herself in all the intricacies and nuances of pricing and marketing in this niche business enterprise. She regaled us with her wealth of insider knowledge about the used book trade, dispelling our misconception that it was more or less like a flea market. In our time at Broad Street Bound, we learned a lot and found the letterbox, too. THE SANTA GREETER HAS COLLECTED SOME DUST SINCE HIS LAST BATH. But there were more boxes, so we hopped back in the car and drove a couple of miles south on US-1, another iconic highway, to the town of Santa Claus, Georgia. Incredibly, this wee burg was smaller than Manassas, with only 0.2 square miles of area though the population was almost double at 165. It came as no surprise that the roads of Santa Claus all bore Christmas-related names—December, Rudolph, Sleigh, Noel, Dasher, and Dancer. And predictably, the street signs sat atop candy-cane striped posts. WONDER IF THE LOCAL KIDS EVER LICK THOSE POSTS? 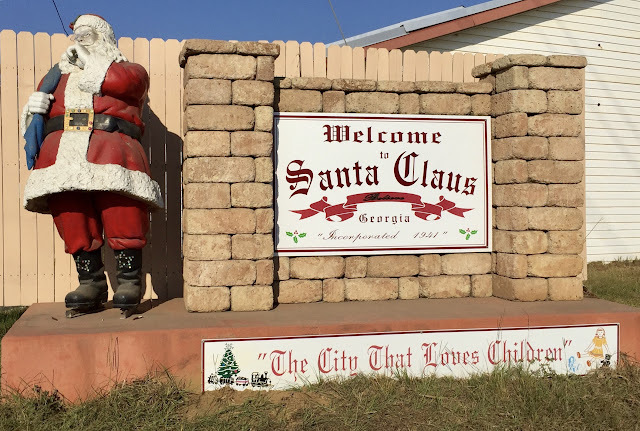 Beyond that little festive touch, however, there wasn't much to distinguish Santa Claus as a holiday-themed town—no Christmas tree in every yard, no sleigh on the town hall roof, not even colored lights strung down the streets. And even if they don't follow the theme year round, shouldn't Santa Claus be beginning to look at lot like Christmas by mid-November? Unable to find any local citizens on the quiet, empty streets to help us solve the mystery of the Christmas-less Santa Claus, we had to settle for finding the letterbox and heading back north. We picked up US-280 again in Lyons and continued west toward Columbus, tonight's destination. Regretfully, we had to skip some of the exciting potential stops on our list due to the sun's relentless determination to drop toward the horizon. No Vidalia Sweet Onion Museum for us today. No Pasaquan folk art compound. Not even a chance to be first finder on some new letterboxes along the route. Before we reached Columbus, two deer ran into the road a few feet ahead of us, their lives spared (and maybe ours too) by Ken's lightning quick reaction. Two especially cordial and attentive desk clerks greeted us when we arrived at the Hampton Inn at 8 p.m., a comforting end to a long day. We cobbled together a meal from our on board groceries and studied our outline for tomorrow. We'll be back on US-80 as it takes us to some historical spots in Tuskegee and into Montgomery, where we'll check out some landmarks of the civil rights movement and stay overnight. Loved: Seeing parts of the countryside that we zoom past when traveling on interstate highways. 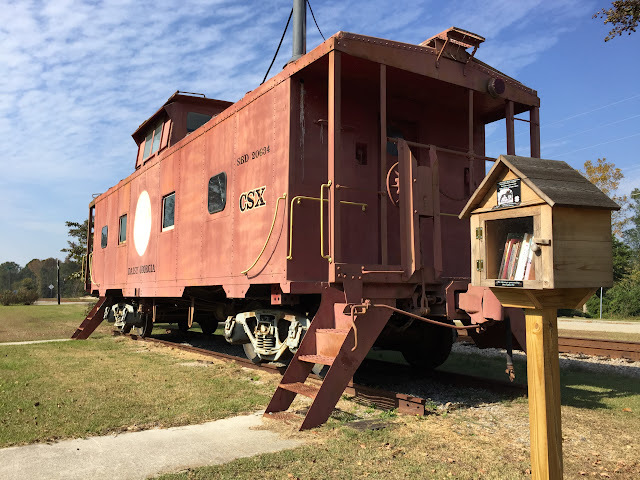 We didn't make it through our list of potential stops, but we stumbled across places and people like the winsome village of Daisy and the enlightened bookseller that made us want to linger. Lacking: Christmas decorations in Santa Claus. Why?? Learned: That there's more to the pre-read book business than we ever dreamed. MORE THAN 70 YEARS AFTER HER DEATH, THE WAVING GIRL STILL GREETS SHIPS. WHAT'S NOT TO LOVE ABOUT SAVANNAH'S LIVE OAK DECOR? NEXT TO THE CABOOSE, DAISY'S OWN LITTLE FREE LIBRARY, THE ONLY LIBRARY IN TOWN. AFTER LEARNING WE WERE NOT FRUIT CAKE FANS, PATTI DIDN'T TRY TO GIVE US A FREE SAMPLE.